Former retail employees from Apple Stores in New York and Los Angeles have formed a class action suit against the iPhone maker, claiming that the company's anti-theft policies amounted to unpaid work to the tune of $1,500 per employee per year. The filing for the suit alleges that "Apple has engaged and continues to engage in illegal and improper wage practices that have deprived Apple Hourly Employees throughout the United States of millions of dollars in wages and overtime compensation." At the center of the plaintiffs' case is the anti-theft procedure Apple requires its employees to go through. At the end of a shift, as well as when clocking out to leave for a meal break, Apple's hourly retail employees must submit to "personal package and bag searches," during which the employees are off-the-clock. The complaint notes that these checks are "significant, integral, indispensable... and done solely for Apple's benefit to prevent employee pilferage." As the employees were hourly and the checks only occurred when they were off the clock, they were not compensated for Apple's security procedures. The complaint claims the employees waited typically between 10 and 15 minutes and the end of every shift, as well as another five without compensation prior to going off for "uncompensated meal breaks." "During any given week," the complaint reads, "[one plaintiff] worked approximately 50 minutes to 1.5 hours of uncompensated overtime. By conservative calculations, this equated over the course of one year to an aggregate amount of approximately $1,400 in uncompensated hours." 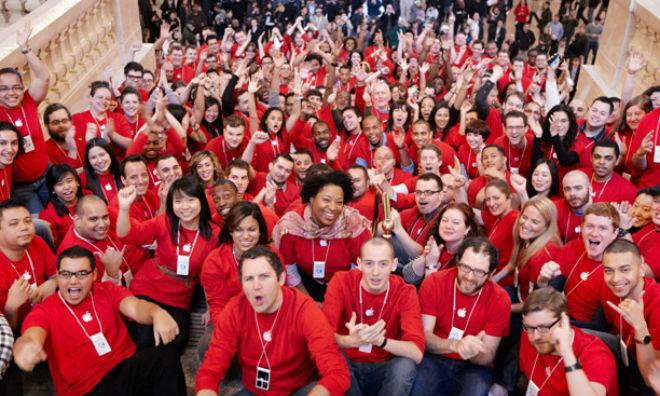 Included in the class action are "[a]ll Apple Hourly Employees who worked in an Apple, Inc. retail store in the United States, who are or were employed within the three years preceding the the filing of this action by the Defendant, and who were: (a) not compensated for off-the-clock time spent waiting in security screening lines and undergoing personal package and bag searches before being allowed to leave the premises; and/or (b) were not fully compensated for this time worked over forty hours per week at overtime rates." It further alleges that Apple's "unlawful conduct has been widespread, repeated and consistent" as well as "willful and in bad faith." Apple's security checkout policy for employees is not entirely unique among retailers, specifically among those dealing in electronic devices. Game retailer GameStop, for instance, has had a similar policy for some time, one in which employees search each other's bags and person following the completion of closing duties. The pocket and bag checks at that retailer, though, are done while employees are still on the clock. The new lawsuit seeks certification as a class action suit, recompense for the plaintiffs and other members of the class in the amount of unpaid minimum wages, unpaid overtime, and unpaid waiting time. It also seeks "a declaratory judgment that the practices complained of herein are unlawful... and injunctive relief requiring termination or modification of the unlawful practices." The case  Amanda Frlekin and Dean Pelle v. Apple, Inc.  was filed on July 25 in the United States District Court for the Northern District of California. The plaintiffs are seeking a jury trial. Apple's retail operations have grown in popularity along with its products, and Apple Retail now represents a significant portion of the company's revenue intake. They are among the most heavily trafficked retail spaces in the world, with yearly visitor counts on the level of popular theme parks. All along, though, the state of employees working in Apple stores has been an issue of contention. Last year, The New York Times published an expose on Apple's retail outlets, revealing that employees were making "average pay" according to the standards of retail, but lower than do employees in some other less profitable corporations. An internal interview conducted by Apple found that pay was a major concern among employees. Staff in the retail outlets earn between $9 and $15 per hour, while Geniuses make roughly $30 per hour.